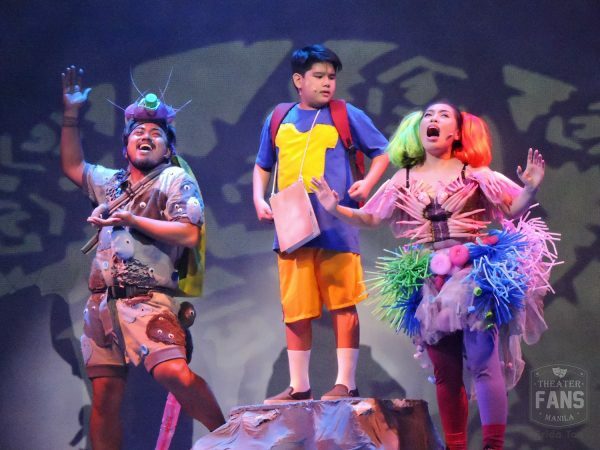 Philippine Educational Theater Association’s (PETA) Tagu-taguan Nasaan Ang Buwan?, treats audiences to a story — and a reminder — about what it means to have a child’s imagination. 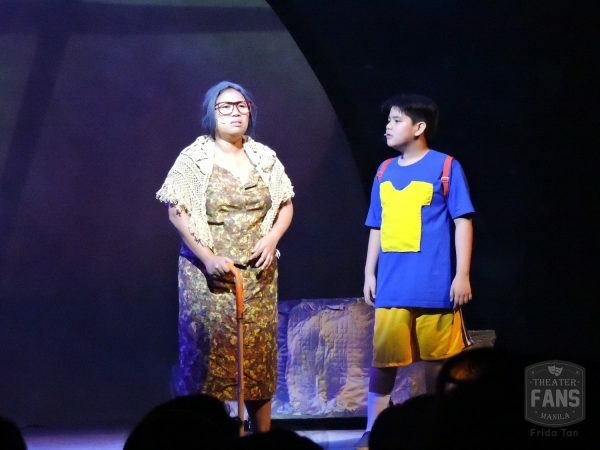 Tagu-taguan is a musical that tells the story of Popoy, a young boy who goes with his father, Jeffrey, to take care of forgetful Lola Luna in her home. Popoy struggles to find something to amuse himself with. Against his father’s wishes, Lola Luna enthralls Popoy with stories of wonder and adventure. His imagination takes him to the land of stories, Saysay Lupalop, but finds it as Dilim Dilim Land, under the curse of Papaw Halimaw. It’s now up to Popoy to save Saysay Lupalop, and he journeys with the help of some interesting friends. 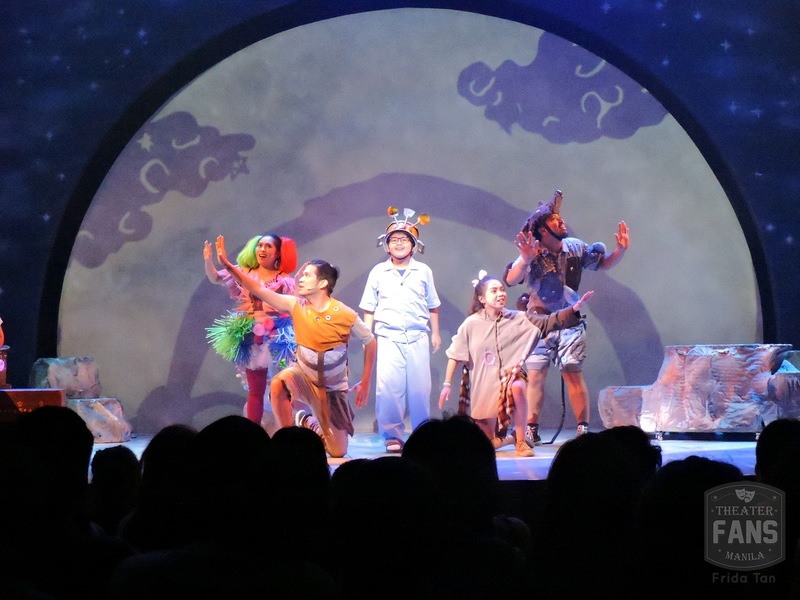 Playwright J-mee Katanyag makes a witty spin-off of children’s stories into a new narrative. Characters from Ngo ang Dagang Patay, Ibong Adarna, Hans Christian Andersen’s The Little Match Girl, as well as Ismail at Isabel, and Batang Rizal become friends with Popoy in Dilim Dilim Land. Tagu-taguan is simple, easy to understand, and enjoyable for both kids and adults. Some dramatic scenes may come off as over-sentimental, like when Popoy sings about his shining heart or when Lola Luna reunites with the characters of the stories, however, it still tugs at heartstrings. Katanyag’s script is enhanced by Dudz Teraña’s direction. Teraña makes sure that the characters have distinct personalities so that everybody is balanced but unique in their own way. Ngo from Ngo ang Dagang Patay gave comic relief, Prinsesa Mina from Ibong Adarna was both an adviser and a devil’s advocate, and Match Girl from The Little Match Girl was anxious and fearful. Ismail and Isabel were always agitated, and Pepe and Pepito from Batang Rizal don’t have a care in the world and want to do nothing but play. Jeffrey was the serious and disconnected father, and Lola Luna was the forgetful but lovable grandmother full of stories to tell even in her old age. Popoy may be the protagonist, but the story is everybody’s, not just Popoy’s. Transitions are not very seamless because “black out, change set, lights on” heighten anticipation and segment the show, making it choppy. However, lights and sounds are well-done, because these manage to set the mood and provoke emotion, like how the lights become red during the face-off with Papaw Halimaw, or how a single, tight spotlight is on Popoy during a big moment of realization. Sounds and music are are also smooth, minus one glitch that almost interrupted a song number. A large moon is the backdrop which also doubles as a screen. Shadows and projections give vibrancy and layers to the show, but sometimes, it isn’t always clear why something is being projected at a certain time. What did the giant, blinking eyes on screen mean? Sometimes, images are also a bit difficult to make out because of how they are stylized. Is that a projection of a monster or a tree? 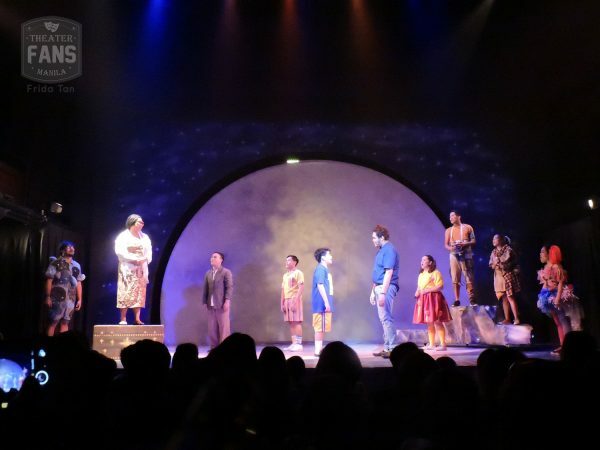 All there is on stage are designed apple boxes, a few mobile set pieces, and the ever-present baul which references to popular children’s stories writer, Lola Basyang, who is Popoy’s ancestor. Since Tagu-taguan is meant to tour, set and props are kept at a minimum. In the real world, the props are realistic; an actual wheelchair, an actual laptop. But, in Dilim Dilim Land, the props are imaginary. A matchstick is a sword, and a paper origami becomes a boat. Similarly, in the real world, characters just wear ordinary clothes. But, in Dilim Dilim Land, the costumes are colorful and absurd. Plastic bottles patched with gray cloth complete Ngo’s appearance, and a bright suit with words painted all over is what we see Pepe in. Papaw Halimaw’s costume is creative, built using plastic bottles and recyclables, and is used like a Chinese lion dance costume. It’s intimidating, effective in portraying the evil in Dilim Dilim Land, and deserves two thumbs up. The most remarkable aspect of Tagu-taguan are the actors. 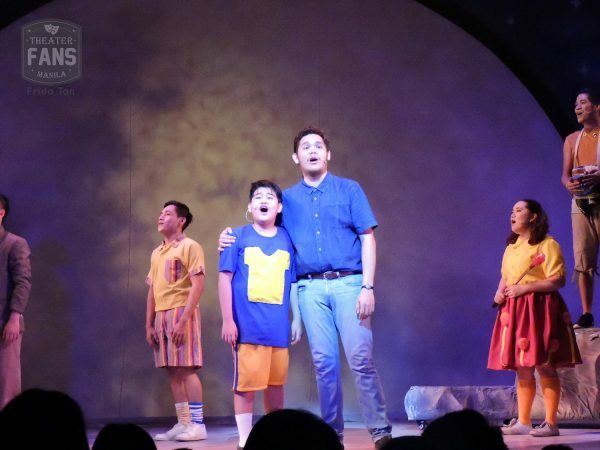 Albert Silos, playing Popoy, is a promising singer-actor and an endearing child-performer. Joann Co plays Lola Luna, and delivers a believable and nostalgic performance; the type that can awaken personal memories about one’s family. Roi Calilong as Ngo is a delight, making audiences laugh through his animation and his ability to improvise jokes. Calilong is an actor who definitely knows how to please an audience. Joan Bugcat is Prinsesa Mina who, because of Papaw Halimaw’s curse, suffers from a split personality disorder. Bugcat is sharp, and is able to sustain her energy and be consistent with keeping the distinction between Prinsesa Mina’s two personalities. John Moran, Angelo Lantaco, Raven Relavo, Yeyin Dela Cruz, Lemuel Silvestre, and Vic Robinson make up the rest of the cast, and each and every one proves to be a quality musical theater performer who certainly deserves recognition in their craft. For a child, Tagu-taguan teaches to imagine big and to have a heart to help others, because being a hero chooses no age. For an adult, the show is a reminder to still have fun and be optimistic amidst hardships. It teaches how to be a good parent, and also how to remain good to one’s parents. 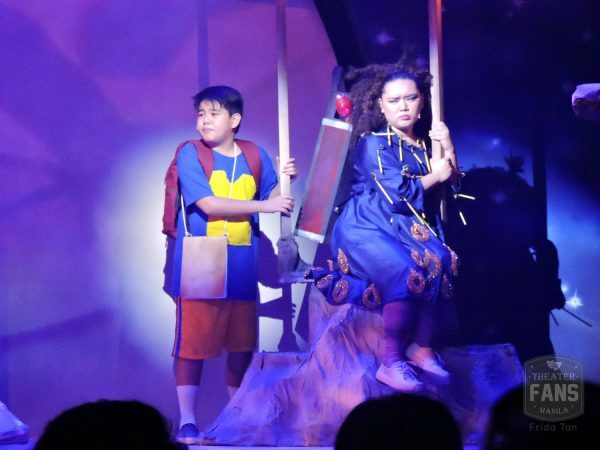 Tagu-taguan shows how powerful a child’s imagination can be. It shows and unites the real and the imaginary by showing the ordinary and especially the extraordinary, because that’s how people — adult and child alike — should learn how to see the world. Dey is currently a BA Broadcast Communication senior in UP Diliman, with a long-time passion for theater and the arts. She's had years of experience with theater on-stage and off-stage, as well as other forms of art and performing. Dey has been active in the Miriam College High School Glee Club and the UP Streetdance Club, and is currently a member of the Tag-ani Performing Arts Society.